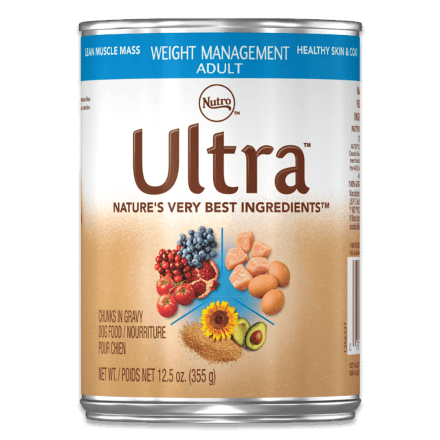 ULTRA™ Weight Management Dog Food is formulated to help overweight and less active dogs achieve and or maintain a healthy weight. Our premium dog food is made with nature's finest ingredients to provide complete and balanced nutrition in every bowl while promoting a lean body and supporting healthy joints. Your dog will enjoy the unforgettable taste of premium, natural ingredients! Chicken Broth, Chicken, Chicken Liver, Potato Starch, Wheat Gluten, Ground Rice, Salmon, Lamb, Lamb Liver, Turkey, Dried Plain Beet Pulp, Whole Grain Oatmeal, Dried Egg Product, Dried Peas, Dried Carrots, Whole Brown Rice, Ground Flaxseed, Guar Gum, Sunflower Oil (preserved with mixed Tocopherols), Sodium Phosphate, Dehydrated Alfalfa Meal, Tomato Pomace, Natural Flavours, Potassium Chloride, Calcium Carbonate, Blueberry Pomace, Cranberry Pomace, Tricalcium Phosphate, Xanthan Gum, Sodium Alginate, Dried Pomegranate, Dried Avocado, Iron Proteinate, Zinc Proteinate, Dried Pumpkin, Salt, Vitamin E Supplement, Dried Spinach, Ascorbic Acid, Choline Chloride, Beta Carotene Colour, Taurine, Thiamine Mononitrate (Vitamin B1), Zinc Oxide, DL-Methionine, Copper Proteinate, Manganese Proteinate, Cobalt Proteinate, Sodium Selenite, Potassium Iodide, Biotin, Vitamin A Supplement, Vitamin D3 Supplement, Vitamin B12 Supplement, Riboflavin Supplement. For Less Active Adult Dogs: Feed according to guidelines under Weight Maintenance. For Overweight Adult Dogs:Feed according to guidelines under Weight Reduction. Once target weight is achieved, switch to Weight Maintenance guidelines. Refrigerate unused portion up to 3 days. Refeed at room temperature. Provide fresh drinking water. NUTRO ULTRA™ Weight Management Chunks in Gravy Dog Food is formulated to meet the nutritional levels established by the AAFCO Dog Food Nutrient Profiles for adult maintenance.